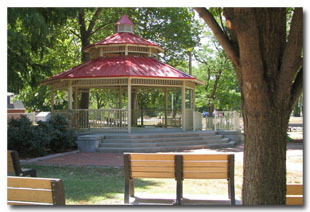 The Gazebo is located across from the Community Center and is ideal for an outdoor wedding, musical presentation or play. It has electric, lights and plenty of bench seating. It has a ramp and stairs leading up to the raised gazebo. It has a red roof and is a lovely, shady spot with a wonderful view of the lake.